Tor Books announces the next book from New York Times bestselling author John Scalzi – The Human Division – to be released first as monthly serial e-books! NEW YORK, NY, July 6, 2012: Tor Books is pleased to announce a very unique new project with New York Times bestselling author John Scalzi. 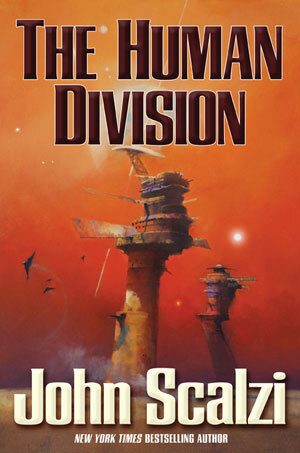 Fans have been eagerly anticipating the newest novel in Scalzi’s Old Man’s War series, and it will be published in 2013: The Human Division. Before its hardcover release however, the book will be published in a series of digital e-book episodes, a new format for the author and the imprint. As Tor Senior Editor Patrick Nielsen Hayden explains: “The Human Divison will be an experiment: an episodic novel, released initially in digital, serialized form. Currently the plan is to publish these episodes weekly between December 2012 through February 2013. Like the episodes of a good high-end cable drama, each one will have enough internal integrity to work as an enjoyable chunk of story on its own, but each will advance a ‘season’-long storyline as well. John Scalzi is a Guest of Honor at San Diego Comic-Con International next week, where he will discuss this special new project, along with the rest of his work, on his spotlight panel, moderated by Wil Wheaton, on Saturday, July 14, from 5:30-6:30 PM in Room 7AB. For more details about John Scalzi at Comic-con, and about Tor/Forge programming there, check out our just released schedule.